This is not a difficult procedure to undertake it just requires patience, correct tools and how to use them. All the torque specs listed here are from the 97 factory shop manual. This procedure is also valid for the smaller 1.6 Miata diff except the torque values are different and you�ll need a 6-7 inch micrometer instead. 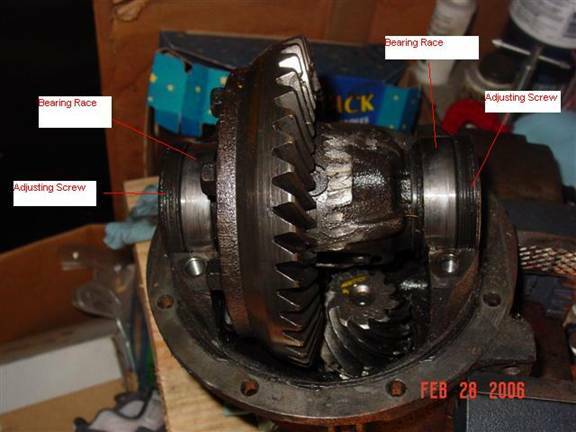 The pictures used in this write-up are of a 1.6 differential since the 1.8 was in my car. 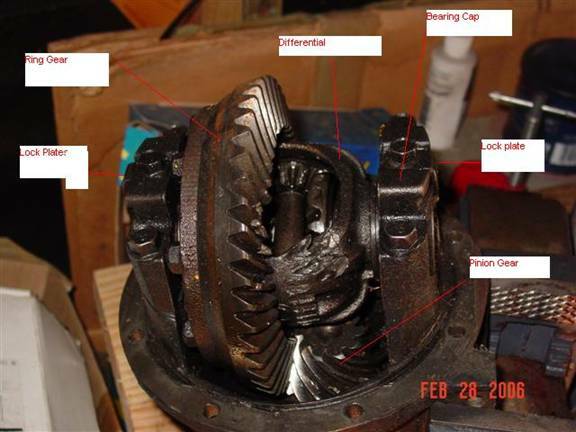 ;-)� The damage seen in the pictures was caused by the pinion shaft making contact with the differential while traveling at 45 mph!! The dial indicator and micrometer I used where bought from ENCO. They are not the best out there but they are adequate for this task. 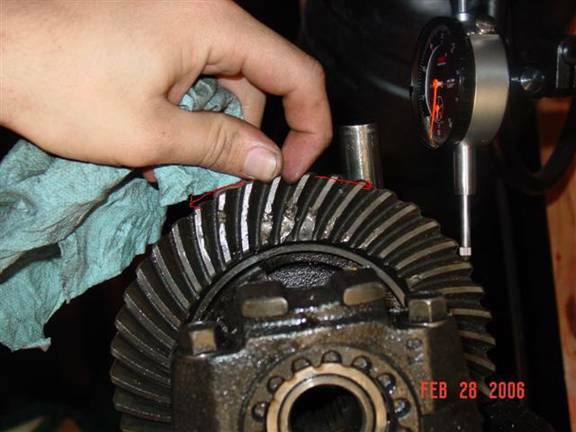 Removing and Installing the Differential and Ring Gear. 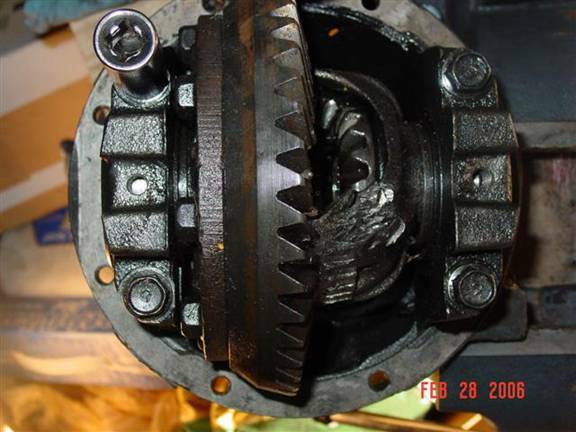 I�m going to begin after the differential carrier has been removed from the car and the aluminum housing has been removed from it to expose the gear set. Note: It has been pointed out that you might want to measure the backlash before disassembly, see page 6 for measuring backlash. This way you will be assured a noise free rear end if it is set the same as before. I have always just set it to within spec and haven’t had a problem but it couldn’t hurt. So you should have this in your vice.� Notice the labels so that we are on the same page on what I am calling things. Now mark with the paint pen one of the bearing caps so that you know which one goes where. Next remove the lock plate from both sides then remove the bearing caps and adjusting screws. STOP! 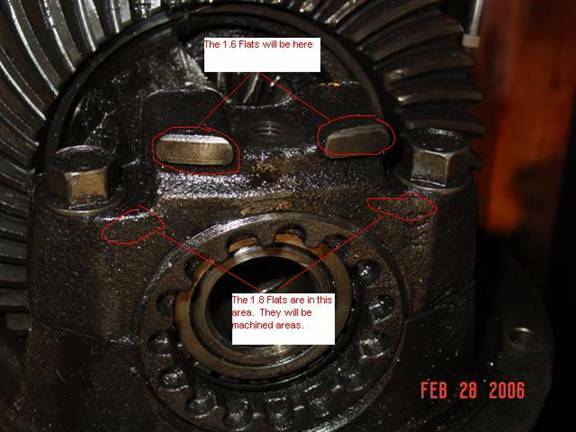 !� At this point mark the bearing races so you know which goes where, do NOT mix them up. 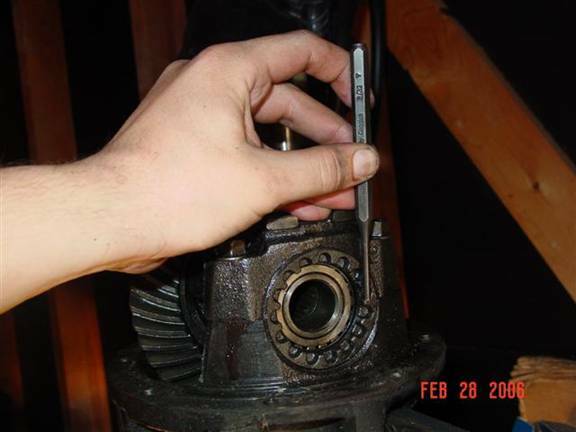 Remove bolts and use a punch to tap the ring gear from differential. 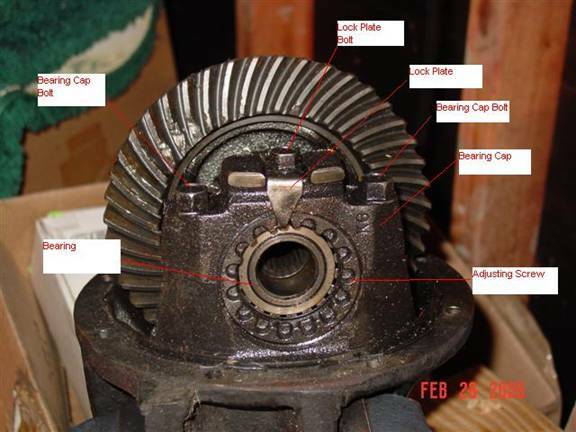 Now put the ring gear on your new differential apply thread lock to the bolts and torque them in three stages (i.e. 1/3rd the torque then 2/3rd the torque then torque to spec) in a cross pattern. 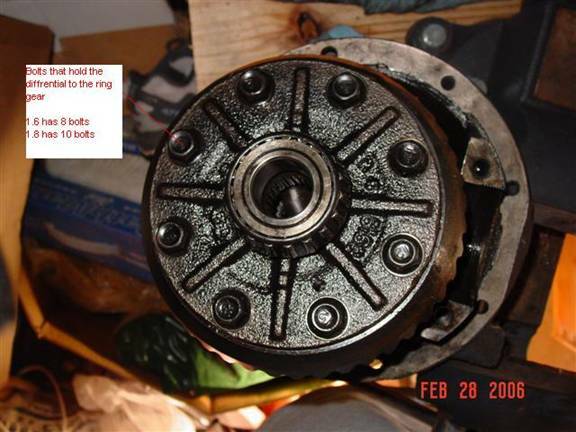 Take the diff/ring gear assembly with bearing races (NOTE: the bearing races are matched with its bearing so make sure they go back on the side they where removed from) and place it back in the carrier. Now place the adjuster screws in place and install the bearing cap. Move the adjuster screw to make sure the threads are threaded correctly. Tighten the bearing cap bolts to 27-38 ft-lb. 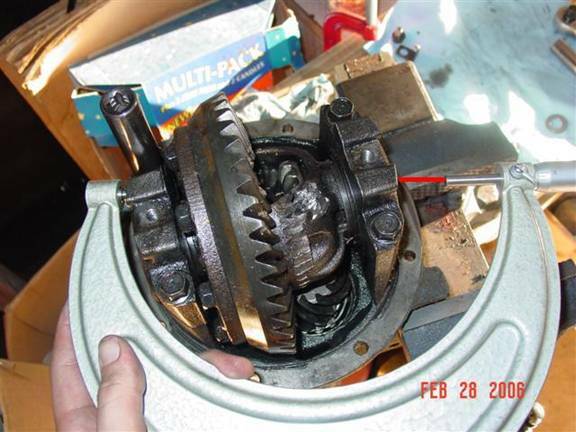 Lock the pinion shaft; I used a c-clamp and my work bench. 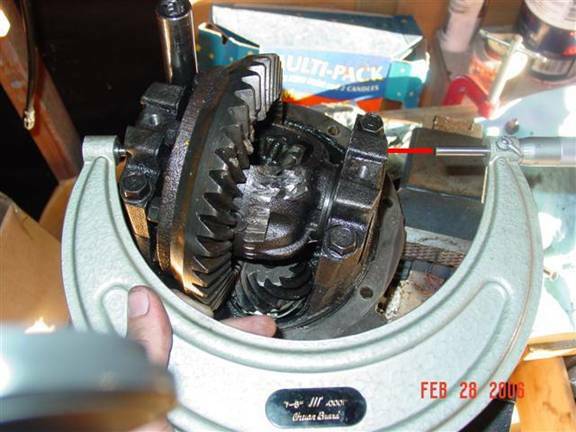 Now move the ring gear back and forth with your hand (remember the pinion shaft Must be locked) and measure the movement of the ring gear with the dial indicator.� This is the backlash. If they are, stop now and go buy a lottery ticket its your lucky day! 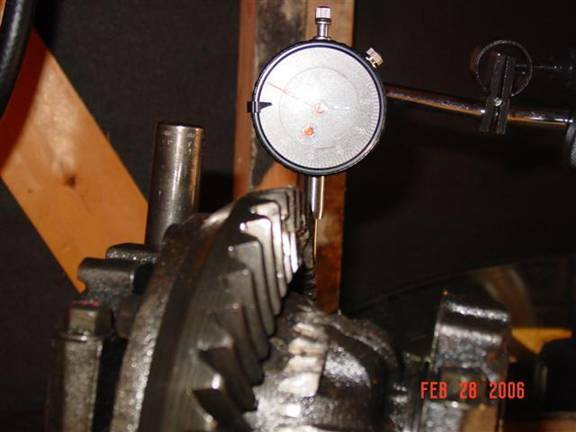 Then when you get back skip ahead to adjusting and setting bearing preload. If the backlash is not in spec this is what you do. 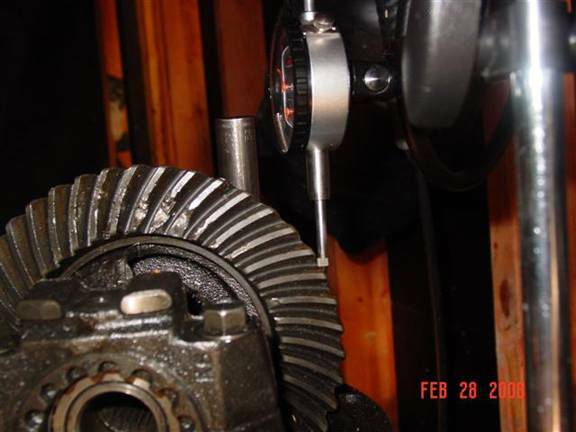 If it is less than spec it means that the ring gear is too close to the pinion gear.� So you want to move the adjuster screws accordingly. Remember that there are two adjusters one on each side I found it easier to turn both by the same amount.� i.e. If you want to move the ring gear to the right. You would screw the right adjuster out and the left adjuster in by the same amount.� I would start out at a � turn in the direction you need and see what that gives you. To adjust I used a punch and a hammer to tap the adjusters in the direction needed. Now go back and measure again just like before at all 4 places.� Repeat until you are in spec for all 4 measurements. Here are the measuring flats. Now measure the other diagonal. If they are not in spec here is what you do. If it is less than spec this means the towers are too close together.� To spread them out you screw both adjusters IN the same amount so as not to affect the backlash. If it is more than spec the towers are too far apart so you want to adjust both of the adjusters OUT by the same amount. Measure and repeat until you get inside the specified range. Next thing you�ll want to do is go back and recheck the backlash.� If you moved both adjusters the same amount when you were adjusting the preload it should still be in spec.� If not go back and fix it then recheck the preload. Once everything is in spec and rechecked, bolt on the lock plates and torque to 13-19 ft-lb.